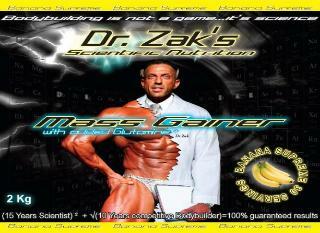 Dr Zak’s mass gainer is the ideal formula for those wishing to put on quality mass. This advanced Protein/Carbs/Glutamine formula is scientifically designed containing the same high quality sustained release protein blend mixture found in the power protein (36g). Also added is a selected specific carbohydrate to give a phased release of glucose into the body for fast recovery and to re-fuel glycogen levels. The mass gainer also contains Glutamine (10g) which prevents muscle breakdown and helps recovery especially post workout. Ideal for hard-gainer athletes and bodybuilders and also an ideal post workout drink. Also includes a complex array of essential amino acids vital for quality training.